A year later on May 10, 1995, at 7:35 a.m. Kash was again told to send greetings to Prophet Muhammad. It was Id Al-Adha again. He meditated and his soul met Shri Mataji in the Niche of Light. The Supreme Light shone ever so brilliantly from behind the Eternal Throne of Al-Muzzammil (The Enwrapped) as She sat in Bliss and Joy. The Messengers of God Almighty were all already there and sitting in a semi-circle; Shri Krishna and Shri Radha, Shri Shiva and Shri Parvati, Shri Vishnu and Shri Lakshmi, Shri Sita and Shri Rama, Shri Brahma and Shri Saraswati, Shri Jesus, Prophet Mohammed, Shri Buddha, Guru Nanak and others. Kash bowed to all of them and exchanged greetings. Kash then told Shri Mataji of his desire to see Prophet Muhammad and extend season greetings on this auspicious day. The Spirit of the Living God got down from the Supreme Throne and asked him to follow Her towards a gap in the semi-circle of the Divine Messengers. Shri Nirmala Devi did not tell him where Prophet Muhammad was sitting or ask him to use his vibrations, as was normally the case. The Ruh of Allah escorted him as She knew that Kash could not speak Arabic and thus would not be able to greet Nabi Muhammad. They then walked back to their original places. The Ruh of Allah then sat on the Golden Throne and invited everyone to begin meditation. All the Divine Beings in unison raised their Kundalinis, did the Bandhan, and went in deep meditation. When the meditation was over Al-Muddaththir (The Enfolded) Shri Nirmala Devi awakened Kash. He requested leave, bowed to Her, and wished the Divine Messengers again. He then slowly descended through the clouds and returned to this scheming world of chosen Jews' and outcast kafirs'. Note: Kash is positive that Prophet Muhammad spoke Arabic as he had heard the language being spoken before, and it sounded similar. He explained that it was different, a language that was "spoken from the throat." Months later, on August 29, 1995, at 12:35 p.m., he was again asked how he knew that Shri Mataji spoke in Arabic. Again he told that the language was different from the one the Great Sacred Mother normally spoke to the Divine Messengers of Hinduism, Buddhism and Sihism which is Sanskrit and Gurumkhi. He was sure it was Arabic due to its guttural tone. He then explained that he had heard this language being spoken on Channel 24 of Vidotron, the ethnic cable television of Quebec (Canada), which has a fair share of Middle East slots. This spontaneous evidence, given without any hesitation whatsoever, could not be disputed and the issue was settled. The Ruh of Allah conveyed the Id Al-Adha greetings to Prophet Muhammad in Arabic — This Revealed Truth is Absolute. This conversation of Allah's Ruh with Prophet Mohammed in Arabic clearly establishes the fact that there is much more to the Oneness of God and His Messengers than previously known or admitted by the false preachers of institutionalized religion. Since Shri Mataji Nirmala Devi and Prophet Mohammed conversed in Arabic, this has identified His Spirit in all Messengers. If Prophet Muhammad was heard speaking to the Great Divine Mother in Arabic, then who is She? If the All Pervading Consciousness was seen and heard conversing to Rasul Allah in Arabic, then who She really is? She is the Holy Spirit of God, the Ruh of Allah, the Adi Shakti of Sadashiva who resides in every human being! To truly comprehend the magnitude of this Revealed Truth requires deep introspection. Only the All-Knowing Allah knows all languages. Allah, through His Spirit, has to know what every human being is talking, thinking or hearing and in extremely rare instances communicate back. Shri Mataji Nirmala Devi has openly declared to humankind that She is the One, the Ruh of Allah, in a human form who has come to this Earth to announce His Call for Resurrection. This must be declared to all nations. Shri Mataji Nirmala Devi is the manifestation of the Spirit of Allah residing in every human being! Shri Majja-Samstha Shri Nirmala Devi is the "Caller from a Place Quite Near' (surah 50:41 Qaf) and The Night Visitant (surah 86:1 Al Tariq) in the Qur'an who announces Qiyamah. She is Al-Muntazar, The Hidden Imam Mahdi prophesied to lead the final Mighty War (Battle of Qa'im) against the Evil Forces. She is the Messiah that all Holy Scriptures prophesied. The Ruh of Allah Shri Mataji Nirmala Devi has made it clear to all seekers of Truth that they have to believe in the Divine Unity of all His Messengers and accept all the Holy Books. Shri Nirmala Devi has provided evidence that all religious institutions have preached falsehood and will not lead to salvation. She has made it imperative that all religious Idols and their centuries-old dogmas are just self-conceived mental concepts of God, observing rituals absolutely incapable of salvation. The Great Holy Spirit Shri Shri Nirmala Devi has made it clear to all humankind that only His Spirit existing within their own beings will lead them to Truth. This is, after all, the Last Judgment and Al-Qiyamah (The Resurrection). "By the token of time (through the Ages), man is in a state of loss, except those who truly believe, act correctly and act together in mutual counsel of Truth and patience' (Al — Asr 103). The Islamic calendar does not start with the birth or the death of a person, but with an event, the migration of believers from oppression to freedom, freedom to practice 'submission to the will of God' in order to attain peace within and around. The advent of Prophet Jesus (Alaih Salaam-peace be upon him) was similarly an epochal event in the history of humankind. The Qur'an calls him a 'sign', a 'mercy', a 'witness' and an 'example'. He is Messiah, Messenger, Prophet, Servant, Word and Spirit of God. The calendar may not be exactly precise but the millennium can serve as an important point of reference in the Divine scheme of message and revelation. And take us into the future. In inviting people to goodness and forbidding from the wrong, Muslims will need to join hands with other believers who share a great deal of these values about good and bad and about right and wrong. The conflicts that we witness today are not conflicts between religions, they are conflicts of irreligion. Therefore, those who believe in God and know the right from the wrong — Jews, Christians and Muslims, especially — can join together to build a not a perfect, but an incomparably better world than we live in today: a society of neighbors who are just and fair to each other. The second half of the millennium has seen two world and several local wars. It saw nuclear incineration of entire populations. It invented a savage new crime against humanity: ethnic cleansing. The new millennium ought to be different. Let the people of faith and goodwill work together to turn it into a thousand years of peace and prosperity, love and mutuality. On the threshold of the next millennium, Muslims have a duty towards the world and towards the fellow humans. It is their unilateral obligation to invite others, and to work together in building a better and a peaceful world: a world which is free from oppression and exploitation, where rights are a reality and where justice prevails over hypocrisy." "His readiness to undergo persecution for his beliefs, the high moral character of the men who believed in him and looked up to him as a leader, and the greatness of his ultimate achievement — all argue his fundamental integrity. To suppose Muhammad an impostor raises more problems that it solves. Moreover, none of the great figures of history is so poorly appreciated in the West as Muhammad.... 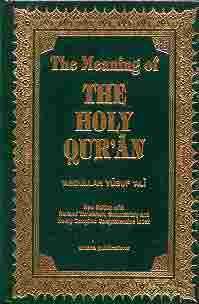 Thus, not merely must we credit Muhammad with essential honesty and integrity of purpose, if we are to understand him at all; if we are to correct the errors we have inherited from the past, we must not forget the conclusive proof is a much stricter requirement than a show of plausibility, and in a matter such as this only to be attained with difficulty."